Water, which makes up over 70% of our body composition, is the most influential and vital component of our health, providing the body with the ability to maintain good health and prevent deterioration. However, this can only be achieved if the quality, content, and structure of the water meet the body’s requirements. By magnetizing your water with our H2O Energizer Personal Use System, its molecules line up in a “+-+-“ sequence. This process changes the water’s properties, reducing its surface tension, reducing viscosity, increasing dissolvability, increasing permeability and increasing oxygen content, all of which makes its nutrients more readily available to our body. Water is then said to be “biologically alive”. If we took two glasses of water from the same place in the same stream — one glass taken a thousand years ago, and the second glass, taken today after pollution has affected the stream’s properties — we would see a measurable difference in the two glasses. In the first glass, all the molecules would be in the right sequence: “+-+-”, “+-+-”. The second glass, would present a totally different picture because most of the water molecules would be in a chaotic order. This is due to massive amounts of pollution caused by the last century’s worth of global industrialization and technologies that interfere with the geomagnetic force of our planet. Because of this pollution, and the chemicals and minerals that are added to our drinking water, the water in our homes, available to us through our public, municipal systems, is “dead water”. We can endlessly attempt to filter and purify it, but we will never be able to make it biologically active, or “alive” without the use of hydrodynamic magnetic resonance. Hydrodynamic Magnetic Resonance allows us to correct the properties of chaotic molecules found in our water today. After the water is magnetized, the molecules immediately regroup themselves into strict rows and the water becomes biologically active. The resulting health benefits are numerous. After consuming magnetic water, our body receives enhanced energy and is more capable of fighting off diseases and our immune system is strengthened. Biologically Active Drinking Water Promotes Optimal Health. Experience the taste of good health and vitality. Comparative shortage of water first suppresses and eventually kills some aspects of the body. Water is the main source of energy – it is the “cash flow” of the body. Water generates electrical and magnetic energy inside each and every cell of the body – it provides the power to live. Water increases greatly the efficiency of the immune system in the bone marrow, where the immune system is formed (all is mechanisms) – including its efficiency against cancer. When water reaches a cell, it brings the cell oxygen and takes the waste gases to the lungs for disposal. 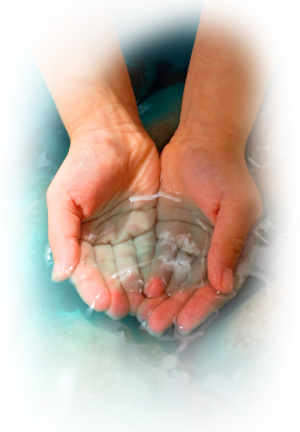 Water is the main lubricant in the joint spaces and helps prevents arthritis and back pain. Water is used in the spinal discs to make them “shock absorbing water cushions”. Water is essential for the body’s cooling (sweat) and heating (electrical) systems. Water is a better pick-me-up than any other beverage in the world and it has no side effects. Water helps reduce fatigue – it gives us the energy of youth. Water makes the skin smoother and helps decrease the effects of aging. Water normalizes the blood-manufacturing systems in the bone marrow – it helps prevent leukemia and lymphoma. Water and heartbeats create the dilution and waves that keep things from sedimenting in the blood stream. The human body has no stored water to draw on during dehydration. This is why you must drink regularly and throughout the day. To lose weight, water is the best way to go – drink water on time and lose weight without much dieting. Also, you will not eat excessively when you feel hungry but are in fact only thirsty for water. Dehydration causes deposits of toxic sediments in the tissue spaces, joints, kidneys, liver, brain and skin. Water will clear these deposits. Water integrates mind and body functions. It increases ability to realize goals and purpose. Water prevents the loss of memory as we age. It helps reduce the risk of Alzheimer’s disease, multiple sclerosis, Parkinson’s disease and Lou Gehrig’s disease. Water helps reverse addictive urges, including those for caffeine, alcohol and some drugs.